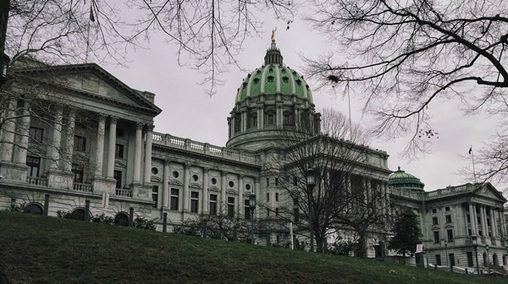 HARRISBURG, PA (WSKG) — This week’s annual budget hearings are giving lawmakers a rare chance to publicly question Pennsylvania’s Supreme Court justices. As justices took questions at a Senate judiciary hearing, the conversation repeatedly returned to the court’s controversial decision to invalidate and redraw the state’s congressional map. The testifiers were Republican justice Sallie Mundy, and Democrat Max Baer. Notably, neither one took part in drawing the court’s new congressional map–though Baer did agree the old map was unconstitutional. Asked whether that was by design, a court spokeswoman said no–Baer and Mundy representing the court was merely a scheduling coincidence. Many questions from GOP lawmakers focused on one of the biggest controversies of the redistricting case–the 18-day timeline justices gave lawmakers to attempt to redraw the congressional map. Baer didn’t defend the decision. “They felt it could be done. They thought it was unpalatable to do an election with unconstitutional maps. I voted that the maps were unconstitutional–I thought they were. I thought we couldn’t get it done, you evidently agree with that. The majority felt they could. What can you say?” he told senators. Mundy largely refrained from sharing her thoughts on the majority opinion, which was handed down by four of the court’s five democrats. But when GOP lawmakers asserted the court shouldn’t have the ability to redraw the map, period, Baer defended the opinion. “If we look at the federal courts, they’ve built jails, they created school systems, they demanded bussing. None of that falls within their bailiwick, but what falls within their bailiwick is to correct unconstitutional wrongs,” he said. “Courts have the inherent authority to correct unconstitutional wrongs when they’re not corrected. That’s what’s occurred here,” he added. As congressional candidates hurry to rebuild their campaigns around the court’s new map, state House and Senate Republicans are still trying to get it overturned. They’ve filed appeals to both the US Supreme Court, and a lower federal court.